H.O. Wright and Sons Ltd. was started in 1954 by Harry O. Wright, and is currently operating with the assistance of his three sons, Colin, Brian and Philip, and three other tradesmen. Among them, the staff has over 100 years' working experience in their trades. Harry Wright first worked in Renfrew, in a government manufacturing plant (Department of Mines) during the Second World War. After the war, he returned to his home town of North Gower, and worked for 5 years in the plumbing and electrical business with William Hicks, another well-known North Gower businessman. 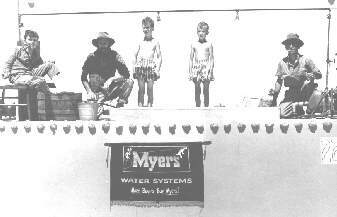 Then he started his own business, at its present location on Church Street. The first shop was moved back from its original location, when a number of properties on Church Street extended their lots by purchasing land from the Seabrook farm. The original shop has had two extensions. Here is a picture of Harry at the door of the first shop. 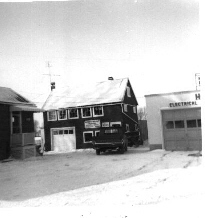 The first shop was built in 1946. 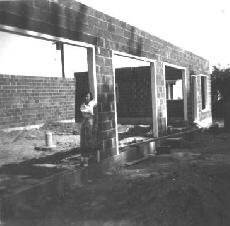 The later building was constructed in 1959. At the Manotick Centennial Parade, 1959 Left to right: Colin Wright, Keith Wright, Brian Wright, Glen Wright, Ken Jannack. A number of employees of H.O. Wright and Sons got a start in a trade: some worked apprenticeships, others have been long time employees, and some have gone on to start businesses of their own or embarked on different lines of work. Ken Jannack is the longest non-family member, having worked 35 years from 1958 to 1993. As is the case with all of the family members, Ken served with the local fire department. It is a testimonial to the level of community service that 27 of 39 past or present employees were members of the fire department. 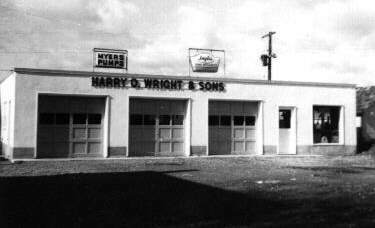 "In 1954, the first year Harry Wright took on a pump line, he sold 25 pumps. 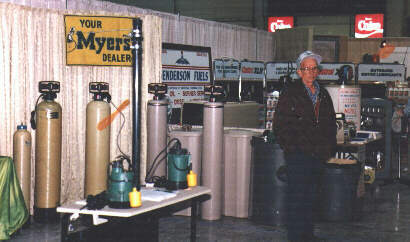 In 1955 he sold 30, in 1956 he sold 40, and last year he sold over 50 units. He expects his pump business to show a similar increase the coming year. In addition to the increase in pump sales, he feels that a similar increase in selling bathroom fixtures can be attributed largely to the fact that he has been successful in the pump business. "'You can't sell a modern bathroom unless there is a good supply of water available," says Harry. "I have picked up a number of bathroom fixture sales from people who were satisfied with the job we did for them on the pump.'" "He feels further that satisfied pump customers have brought him additional business in heating, electrical work, and tinning, his other business lines. "'There is no end to what good a satisfied customer can do for you,' observes Harry. "A quick look at the installation records of Harry Wright and his two brothers who help him, is a good indication of why the firm can boast of a number of satisfied customers. Of the 160 pumps installed by the Harry Wright organization over the past four years, there has not been one time that they have had to go back to correct or replace a faulty pump. The few service calls they have made on the equipment they have installed were due to either water logged tanks or, in a few cases, a frozen pump. "It doesn't take long for the word to get around that, when Harry Wright installs a pump, it is installed right." 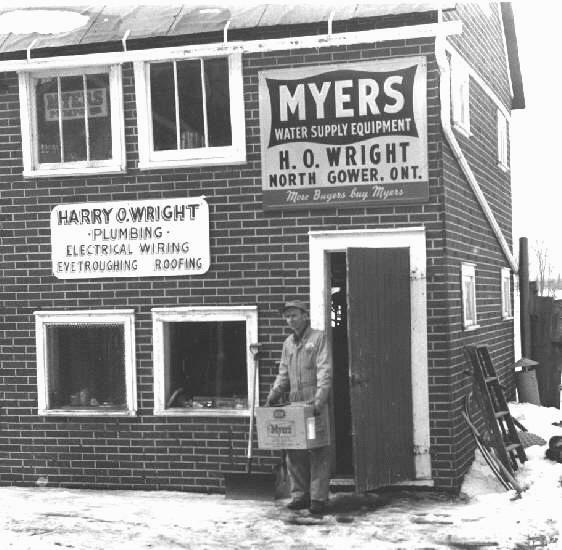 When Harry Wright began to sell and service Myers pumps and softeners, they were supplied by Palmers Plumbing Supply, Ltd. of Ottawa.